In the classroom: Shooting for the stars Mach 2. Shooting for the stars Mach 2. 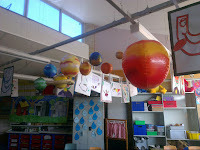 Some of you may remember that I taught a unit of work about space to a group of reception children last year. I loved it. They loved it. Happy dances all around. (If you can't remember, or never read about it, you can here.) Since then I've put together a much more involved grade 5 unit of work on space and have pinned about 9 gazillion awesome space resources (they're spread through my Classroom Coolness: Science board if you're interested). I've also revisited my reception unit of work with another class. "Why did you teach them about space? When are you going to teach us?" Well there's actually no answer to those questions that are acceptable to most 5 year olds! We had one more week together and no pre-arranged commitments so I threw caution (and my plans) into the wind and announced that the following week was to be Space Week. We completely immersed ourselves in learning about space, becoming space explorers who visited at least two planets a day. We read, wrote and drew about stars and planets. We created art work and made human models of the solar system. It was, like last time, a fantastic experience. How was it different to last time? We concentrated on Space (to the exclusion of everything else) for one week instead of focusing on it for a session a day over four weeks. There are advantages to both, but I understand that this way is certainly not often possible or desirable. The students were much younger (mostly in their first (or second for a couple) term of reception) and so relied more heavily on me for guidance with their writing. I approached the learning from a narrative perspective. Each day we climbed inside our space ship, put on our space helmets, buckled our belts etc., before zooming off to the next planet. I hung an inflatable solar system in our room so that we knew which planet we were looking for each trip. As we pulled up our space ship we made observations about what we imagined we could see and record these. We compared our observations with recorded information on posters, in books and on websites. We were often surprised at what we learned in these comparisons. There was less writing (although we wrote plenty - more than for the whole other three weeks put together!) and more art. These children LOVED their art. 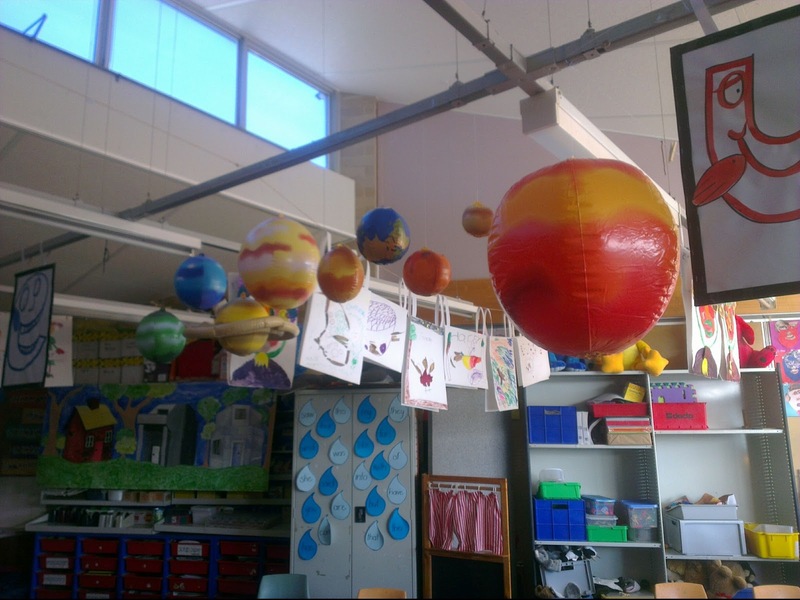 Check out some of these amazing solar systems they created. We were able to share our learning with the other junior primary classes who all came to see our space journals, solar system hats, solar system wall hangings and art during one big exposition on the final day. Boy were we proud! So, whilst it felt a little like I was cheating (because I was able to recycle a bunch of my resources and planning) my second space unit was really quite different. I'm really looking forward to the opportunity to teach an older group about some space related topic. It's such a fun topic! How do you teach about the solar system and space? *I only use my tablet at school and am very careful around which photos remain accessible in this way. "Fly me too the moon and let me sail among the stars...."
*sigh* makes me want to go back to Primary School teaching again.I love the full integration of a unit that is possible at this level. Come baaaack! :) Integration rocks! I'm not sure how I'd cope in a secondary setting.